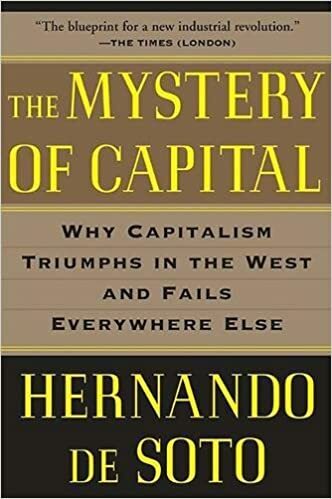 “The hour of capitalism’s greatest triumph,” writes Hernando de Soto, “is, in the eyes of four-fifths of humanity, its hour of crisis.” In The Mystery of Capital, the world-famous Peruvian economist takes up the question that, more than any other, is central to one of the most crucial problems the world faces today: Why do some countries succeed at capitalism while others fail?In strong opposition to the popular view that success is determined by cultural differences, de Soto finds that it actually has everything to do with the legal structure of property and property rights. Every developed nation in the world at one time went through the transformation from predominantly informal, extralegal ownership to a formal, unified legal property system. In the West we’ve forgotten that creating this system is also what allowed people everywhere to leverage property into wealth. This persuasive book will revolutionize our understanding of capital and point the way to a major transformation of the world economy. Good thing I didn’t judge this book by it’s cover. Positive quotes from Bill Clinton and George Bush (Sr) aren’t usually the way to my good side. Plus, De Soto is certifiably “neo-liberal”. But I enjoyed this book and pretty much agree with what the author has to say-amazingly! Of course, then there’s the matter of what De Soto DOESN’T say-it would be interesting to read critiques and or debates by others- Marxist and otherwise. But this is a well written book with some great insights. Check out what Wikipedia has to say about Hernando De Soto as well.